A Paraiba tourmaline is a blue, bluish green to greenish blue or green tourmaline, of medium-light to high saturation and tone (relative to this variety of tourmaline), mainly due to the presence of copper (Cu) and manganese (Mn). The name of the tourmaline variety ‘Paraiba’ is derived from the Brazilian locality where this gemstone was first mined, but other sources such as Nigeria and especially Mozambique are known today. The photo of a Paraiba tourmaline depicts the gem at the time of testing. The photo on an SSEF report is for representational purposes and does not necessarily represent actual colour, clarity or size. For size comparison purposes, approx. magnification used is provided under the photo on the report. 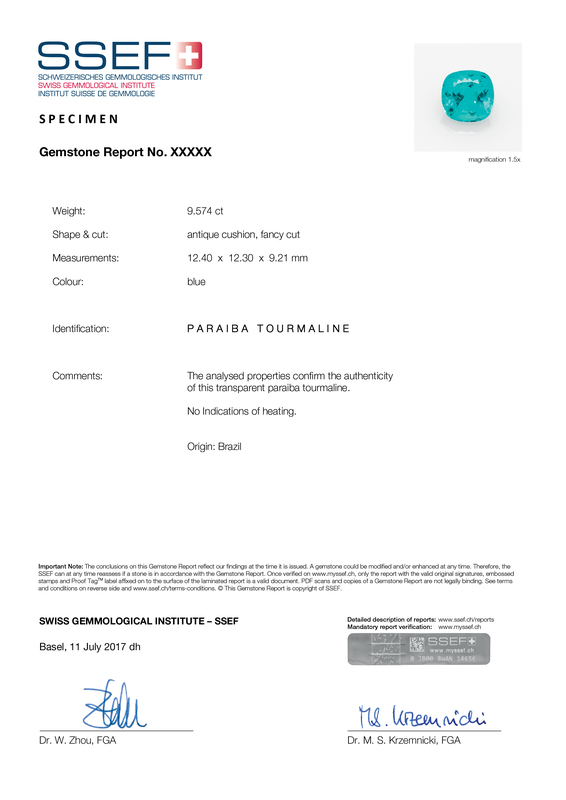 Weight of a Paraiba tourmaline in carats, measured and stated with 3 digits. In the case of mounted jewellery, total weight corresponds to total weight of jewellery item(s) and is stated in grams. Estimated weight is an estimation -for example- for stones mounted in jewellery. The actual weight of a stone may be different to the estimated weight and can only be determined unmounted. The colour of Paraiba tourmaline is described using descriptive terms such as blue, light blue, greenish blue, green. No trade terms (e.g. electric blue, neon blue) are used by SSEF on reports. This copper- and manganese-bearing tourmaline may also be called ‘Paraiba tourmaline in the trade. Paraiba tourmalines are commonly heat treated. If a Paraiba tourmaline is not heat treated (and this can be confirmed gemmologically), the comments section would mention: “no indications of heating”. If the stone shows indications of heat treatment, the report would mention: “indications of heating”. In case a fissure filler (e.g. oil or artificial resin) is detected this would be mentioned in the comments section of the report and would be quantified (minor, moderate, significant).